John and Paul met in July of 1957– both were teenagers who loved Rock ‘n Roll. Paul was soon asked to join John’s local band, which john had dubbed “The Quarrymen”. There were hundreds of teenage Rock ‘n Roll bands in Liverpool, England, during these years. Every musician dreamed of striking it big, like every teenage guy’s idol, Elvis Presley. The special added-in factor of the “self-written songs” was soon to set the Beatles above all the other local groups. Paul’s first composition was called, “I Lost My Little Girl” (written right after the tragic death of his mother to cancer). Soon thereafter, John came up with his first solo composition- “Hello Little Girl”. These were individually written songs, but John and Paul soon realized they preferred, both for personal enjoyment and for quality, writing together as a team. Writing songs together soon became an almost-daily ritual with the two close friends. John and Paul would play hooky from school and hop over (usually) to Paul’s house, which was unoccupied during the day. The two truants would take out Paul’s father’s pipe, stuff it with some Twinnings tea leaves, and “smoke” the pipe together. Then they would sit a few feet apart, each with guitar in hand, and start composing songs (“Eyeball to Eyeball”, John was to call their method). In this casual, friendly environment, John and Paul wrote some of their rudimentary tunes together. To each newly written song was proudly added the little phrase “another Lennon-McCartney original”. Over the years, of course, the two were to compose scores of songs which were to captivate and bring joy to millions of people. But now let’s jump to late 1962 and address the title of this article. In September of 1962, the Beatles had just recently been officially signed to their proud, new recording contract with EMI records. George Martin, the group’s brilliant producer, had heard several songs from the Lennon-McCartney canon and decided they weren’t really “up to snuff”. It was during this early September recording session that Martin insisted the boys record a song called “How Do You Do It?” (written by Mitch Murray). John and Paul, pretty cocky for this early stage of their career, put their collective foot down. “No”, they said adamantly, they only wanted to record original Lennon-McCartney songs. But at this early stage of the game, Martin’s word was law. And thus, the Beatles laid down, against their will, a fairly routine version of the pleasant, if unexciting, song. (Listening to this unreleased Beatles “How Do You Do It?” record, one can hear a very slight trace of sarcasm in Lennon’s voice as he sings lead. Nonetheless, it is still quite a nice record for 1962- professionally done and neatly recorded). They happily (and gratefully) did a peppy, enthusiastic version of the song the Beatles had rejected. 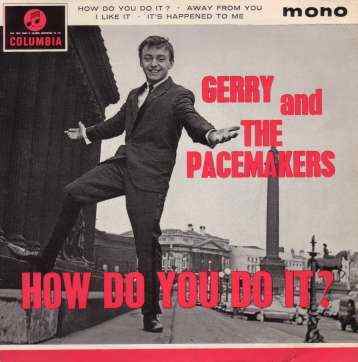 In March of 1963, Gerry & The Pacemakers version of “How Do You Do It?” hit number one on the record charts. Thus, “How Do You Do It?” became the first and only song the Beatles ever rejected, which ultimately went to number one without them. One of the most interesting sidebars to this brief blip (and misjudgment) in the Beatles early career is their sheer and utter confidence in their own compositions- remember, they rejected “How Do You Do It?” in September of ’62- this was a full month before they had even released a record themselves! But I guess to make it as big as the Beatles did, you must “know” how good you are, or at the least exude confidence (even at this stage if it was perhaps overconfidence). Did the Beatles ever regret passing on a “number one”? Probably not. Yes, they missed having a hit record, but the Beatle bandwagon was starting to build up steam by the early months of 1963, and if they did feel any remorse, they didn’t really have the spare time to indulge in it. Meanwhile, Gerry and The Pacemakers went on to release two records after “How Do You Do It?”: “I Like It” and “You’ll Never Walk Alone”. Both of these songs also went to number one. This made Gerry and his boys the first group in music history to hit #1 with each of their first three releases. Of course, “How Do You Do It?” was knocked out of its number one spot by a song called “From Me To You”- by a fresh, new group called…. The Beatles. The Beatles went on, as we all know, to riches and fame beyond anything they could have realistically hoped for when starting out. As for Gerry and the Pacemakers, after their incredible three-in-a-row string of initial hits, they were never to have another number one record in the U.K.
Perhaps The Beatles turned down the song “How Do You Do It” because they could not read music and if the sheet was handed to them, of course, they would reject it. Maybe even George Martin had to hum it to them. There was another time when they were handed sheet music to do backup playing for another singer and they just looked at each and said what is this?